Yemen – Missing from the Story? 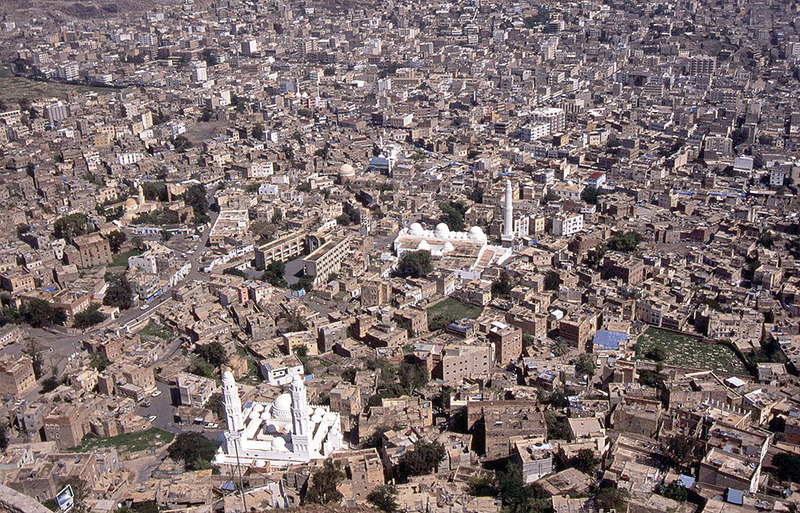 Taizz, Yemen. In the foreground, Aschrafiyya Mosque, September 1, 2004. By Bezur, and republished under Creative Commons Attribution-Share Alike 3.0, Wikipedia source address: https://commons.wikimedia.org/wiki/File:Taizz.jpg. For years “human rights” groups, aid organizations, other NGOs, and the United Nations have dishonestly claimed that almost every Israeli military action is a war crime. Beginning March 26, 2015, the Saudi-led Coalition fighting to defeat Ansar Allah—the Houthis—in Yemen has also been accused of war crimes. There’s absolutely no evidence that the Coalition is violating international humanitarian law. The reality is that Coalition air strikes are being carried out with nearly supernatural accuracy. But do you know who’s committing war crimes right out in the open? Russia. Where’s the outcry? The term “war crime” has completely lost its impact through overuse by liars with agendas. Now nobody cares about genuine atrocities. First, let me reiterate what I determined by adopting the same methodology as Action on Armed Violence (AOAV): I read English-language media reports about the fighting in Yemen. It’s absolutely clear that the Houthis are responsible for the overwhelming majority of civilian casualties. When the Coalition carries out major operations against the Houthis, civilian casualties go down. Wictor, Thomas. “The danger of calling everything a war crime.” Thomas Wictor (Blog), September 30, 2015. Damascus, Syria – A delegation from the pro-Assad Syrian National Defense Army visited Yemen last week through Beirut International Airport, private sources told ARA News. “Such visits are aimed to increase coordination between the Syrian regime and the Houthi group in Yemen and plan to bring the latter’s members to Syria in order to receive military training as well as to exchange security information between the two sides,” a regime-linked source told ARA News on condition of anonymity. ARA News. “Syrian regime coordinates military training with Yemeni Houthis.” March 9, 2015. Perhaps there’s more to Yemen’s struggles today than covered by Big Media’s foreign press. BackChannels hasn’t looked (yet) but while Iranian “war by proxy” appears of evident interest with the March instance of Syrian meddling noted, one may wonder how the middle temperament of the Yemeni people has been either overlooked or inadequately noted and remarked. “Happy Yemens” – South-Central Yemenis Shout Out! What’s Happy Yemens? Happy Yemen, Arabia Felix was the name Romans gave to Yemen. The organization is called Happy Yemens, promoting the interests of South and Central Yemen, two distinct parts of Yemen fighting with the Northern North for the past 800 years that the international community has been trying to silence. The international community is trying to hide our existence, and paint it as a Saudi-Houthi war. They only use voices from Sanaa & the Northern North who have never been to South & Central Yemen, nor do robbers and occupiers understand the reality of whom they have robbed and occupied. Most journalism is “Sanaa journalism” interviewing our occupiers about us. We aim for South and Central Yemenis to speak for themselves rather than our occupiers speak for us. Bolding and italics added by BackChannels. Following, for a while. As with so many others incapable of rejecting a sect (in its entirety) within a religion of which one is not a part and over a conflict that is distant and — and I will assign blame to Khamenei and others of feudal mind and ambition — archaic, I don’t want to weigh on the scales. I’ve found the same divide in Shiite and other circles where claim is made about being “the Jews of islam” (and persecuted by Sunni Muslims). Nonetheless, one understands: where this kind of conflict is hot — the bullets are flying and the bombs are going off and lives are being ended, shattered, or threatened in the most direct ways — polarization is as unavoidable as it is destructive and seemingly impossible to repair. The place where the bullets are flying: Yemen. The drift of sympathy: against the Houthis as representative of Ayatollah Khamenei’s War by Proxy that in turn defends feudal absolutism and seeks to expand the regime’s power against Sunni interests. In another and now increasingly distant age — even 25 or 50 years ago may now seem like centuries — the Yemeni part of the Islamic Small Wars would been played as a clipping in the back of the “A” section of the newspapers, a remote tribal war to be overlooked by western indifference. Our Facebook friends are either there or have family and friends who are close to live fire — not only in Yemen but everywhere being razed and ruined by these forces — and we’re watching without recourse to choosing a good and bad side except against the “al-Qaeda Typicals” and the “Hezbollah Virus”, i.e., operations with military wings so awful that the good of the planet would seek to shut down regardless of other disagreements stemming from nominal affiliations and associated cultural, political, and religious self-concept. Instead, some of us seem to be standing by friends on both sides and hoping the theme of “The Medieval vs The Modern” will catch on before the medieval world, which some are working hard to sustain, swallows the modern. That outcome may not be possible across continents, but it seems to be proving possible in both the Middle East and Eastern Europe (with Putin-Khamenei as the hub from which so much chaos, destruction, and political confusion emanate). Meanwhile, the three-days of talks on Yemen’s future saw hundreds of politicians and tribal leaders gather in the Saudi capital. The meeting was boycotted by the rebels and their Iranian backers voiced objections to the venue of the talks. Western countries accuse Shiite power Iran of backing the Houthi rebels, something the Islamic Republic and the rebels deny. The absence of the Houthis at the conference in Riyadh, which is to end Tuesday, means the dialogue is unlikely to end the violence. AP. “After truce, Saudi-led coalition resumes airstrikes in Yemen.” Boston Herald.com, May 18, 2015. Reuters. “At least 10 killed in overnight fighting in Yemen’s Taiz.” May 17, 2015. Posted to YouTube May 17, 2015. News24 – Posted to YouTube May 17, 2015. Al-Haj. Ahmed. “Saudi-led airstrikes in Yemen resume after truce expires.” Houston Chronicle, May 18, 2015. As suggested by the now blank “News24” patch in this post, even “newsies” appear to lift material and label it new. BackChannels avoids doing that but until “vetted trusted direct sources” feed up authentic reportage, the view from journalism’s “second row seat to history” may be skewed by what appears and can be accessed in open source online. SANAA, Yemen — The Saudi-led coalition carried out the heaviest airstrikes near the Yemeni capital since the expiration of a five-day truce with Yemen’s Shiite rebels, hitting weapons depots in the mountains surrounding Sanaa and shaking several residential areas on Tuesday. The bombardment began shortly after midnight Monday, with airstrikes targeting rebel-held military depots in the mountains of Fag Atan and Noqom, where missiles, tanks and artillery are kept, the residents said. Al-Haj, Ahmed. “Saudi-led coalition carries out some of the heaviest airstrikes on Yemeni capital after truce.” Minneapolis Star Tribune, May 19, 2015. Reuters – April 13, 2015. Iran’s war-by-proxy sneaked under cover of negotiations over its nuclear program has tragically turned Aden, Yemen into another battered middle east war zone in the fashion known to “Putin-Khamenei-Assad” — merciless, mindless, piratical, and ruthless. The troika have been waging the medieval against the modern — the destructive and thieving potential of absolute power against the productive democratic distribution of power — for years, and visible so since the onset of Syria’s civil war. With the distribution of military personnel into Crimea and Yemen, the dynamic Putin-Khamenei duo have brought payback in flooded oil markets and online opprobrium, although I don’t think either Putin or Khamenei bothered by criticism, at least not on the surface and outside of their bailiwicks. Three sources in the southern port city’s anti-Houthi militias said the Iranians, identified as a colonel and a captain, were seized in two separate districts that have been rocked by heavy gun battles. “The initial investigation revealed that they are from the Quds Force and are working as advisors to the Houthi militia,” one of the sources told Reuters. Mukhashaf, Mohammed. “Yemeni militiamen say captured two Iranian officers in Aden.” Swissinfo.ch, April 11, 2015. Tharoor, Ishaan. “Saudi and Iranian leaders wage war of words as Yemen burns.” The Washington Post, April 13, 2015. Justice, Adam. “Yemen: Food shortages and ‘people have not water’ in Aden as fighting rages.” April 13, 2015. VICE – September 10, 2014. Lonely bloggers cannot compete with funded international media in reporting the news, unless we have unusual friends on the ground. However, as audience to mainstream media — and conflict adventure media — we may wrap events differently online, read about what we are seeing when we’re offline, and perhaps approach conflict and political analysis with something combining humanism, journalism, and scholarship. As regards the above clip, this blogger may reflect on what a single lie can do in the way of evil. That audience: handled, misguided, maneuvered, used. It appears they haven’t the means or temerity to question what they’re told (and independently discover for themselves who has been lying to them all along — and why). On August 22, 2012, I picked up a story making the rounds on Facebook having to do with reporting the emergence of crucifixion in Egypt, and I looked into it (“Be Careful of the Truth — Crucified Christians in Egypt — Not Corroborated”). A downloaded copy of the photograph accompanying the claim yielded no IPTC (International Press Telecommunications Council) data, and continued web searching led me to what I considered a reliable debunking. However, with credit extended to the Middle East Media Research Institute (MEMRI), not only the picture but a video clip of the same appeared in relation to a spy caught having betrayed an Islamist group in Yemen. I saw it first here on the Blazing Cat Fur blog, n.d.
A subscription is required to view it — same or different, but same category — on the MEMRI site, and I’m looking into that. The flip with dates (August 22, first round; August 27, posted by MEMRI; by August 30, well along in the anti-Jihad industry) I take as indicative of how information continues to crawl off the street and up to the web from the world’s most remote locales. In the meantime, the Blogosphere seems to have picked it up and gotten its facts straight — “Sheik Yer Mami” (Winds of Jihad) notes a Jihad source on YouTube as a primary location (see “Crucifixion in Yemen,” August 30, 2012 for the video plus that detail). I suspect most believe the “War on Terror” involves neutralizing a number of violent moral entrepreneurs and their networks, but to my mind that’s a small part of a much, much larger story having to do with the development, installation, and continuing support of certain critical and laudable values and virtues worldwide, starting with the definition of “good conscience” (it’s not mapped the same for everywhere, one reason I’ve launched this blog)) and then the possession by persons and groups of credibility and integrity within themselves and in relation to other persons across a world rapidly integrating its communicating and information resources and content. War may be called deception; taqiyya may be advised: evil, however, begins with such easily digested lies and the lies to come from having swallowed both. In war, deception may be a tactic, but wars are about other things — e.g., the possession of resources; the displacement, modification, or termination of cultures and their customs and languages — and “taqiyya”, ever loosely accessed (one well may lie to save life — for the western mind, there’s not much need to put a label on that), seems only to serve to make liars out of people who would otherwise be forthright. When an overzealous, special interest press chooses to copy a photograph appearing in one context or application in an event alleged to have taken place elsewhere, it corrupts, dishonors, and sabotages itself. Yesterday in Eritrea; yesterday in Somalia; yesterday in Waziristan; yesterday in Gaza: aggressive spoilers, parties to war, parties to cultural imperialism or annihilation (both) in the name of one cause or another, could, would, and did, with impunity, fabricate stories a very few or none could check. Their common intention (never mind ends): power through the manipulation of perception in line with mercenary agendas. For the more remote regions of our planet, that thing called “yesterday” is closing, swept away by camera phones, tablets with recorders, and the World Wide Web. It may go shaking its fists. However difficult it may be to see it; however short our lives in comparison to such processes — and this across a frontier unique in recorded history, i.e., a frontier about mind globally — the past that has been past for some time will recede.